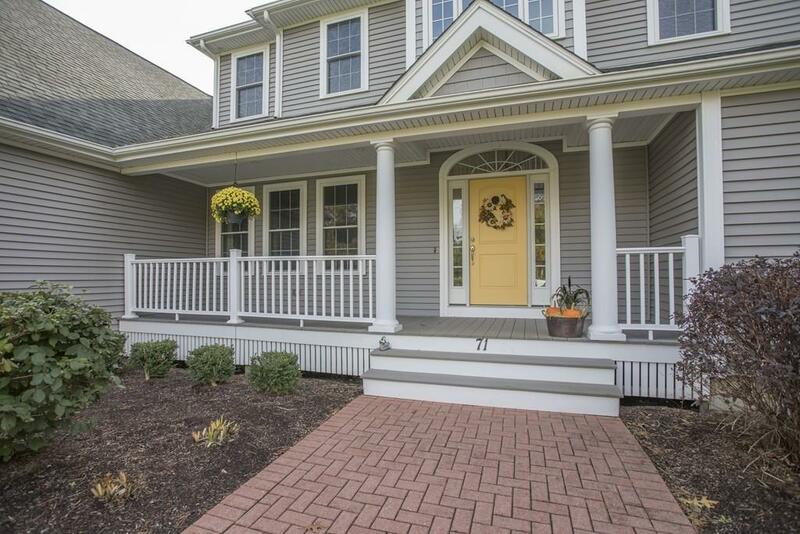 Beautiful custom built 4BR, 4.5 Bath Colonial with all the touches that one would expect in a quality custom built home. Crown molding, pocket doors, wainscoting, combined with 9ft ceilings enhance the luxury and elegance of this property. The professionally landscaped yard will welcome you home as you drive in to the 3.5 car oversize garage. This house was built for entertaining with an open floor plan, lg Dining Room, wet bar in the Great Room, multi level deck complete with hot tub and sprawling lawn equaling 5.5 acres of privacy. The Kitchen is a chef's dream w 3 ovens, warming drawer, lg walk in pantry, granite counters and high end appliances. The Master suite features two large walk in closets, sitting area, recently renovated spa like bath with attached craft room or private den. The second floor includes 3 add'l BRs, ea w a full bath, a media room, small playroom and a gym. Home is wired for surround sound, has walk up attic & walk out basement! Must see to appreciate!